Watch the video for tips on what to look for to seal or repair a chimney. Most chimneys need some maintenance over the years. The flashing comes loose, or the grouting starts breaking out. Most roof leaks are due to a lack of chimney maintenance. To use the incorrect chimney sealant could become very costly. Silicone spray-on stuff does not work and also caulking is not the way to seal a chimney. In most cases caulking a chimney will cause problems and caulking hs to be removed before a proper repair can be made. There are three primary areas to check on a chimney what can cause leaks. The crown – That’s the cement slab at the top of the chimney. After many years the slab cracks and water leak inside the chimney causing the water to freeze during winter. The ice will crack the chimney or bricks. The face – That’s the brick or stone part of the chimney. 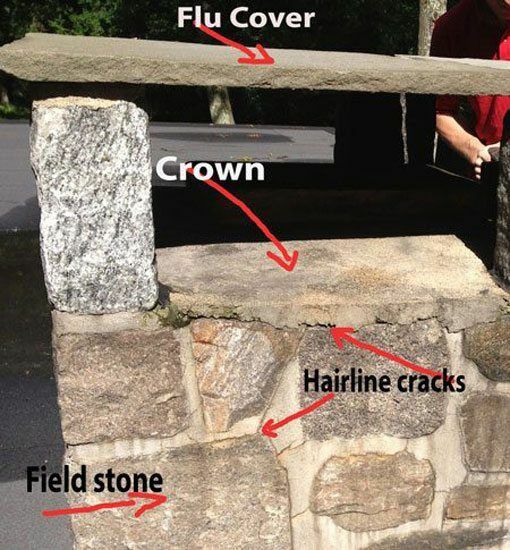 Many times the grouting has cracked, or the stone is coming loose due to the crown that was letting. This stucco chimney needs maintenance. When a chimney gets neglected like this one, then it will cause a roof leak. Notice the cement slab pulling away from the brick. The crack will allow water in and during winter freezes up causing the grout to crack further. The next part to inspect is the flashing on a chimney. It is almost a guarantee that you will find that the flashing causes the leak. Tis happens when the grouting that is suppose to hold the flashing in position, has come loose and is no longer a seal. Chimney flashing is one of the major causes for leaks. Caulking and tar is not the way to fix the flashing. Turbo Poly Seal from Bergstromm.com as been my go-to product to seal cracks on flashing and chimney crowns. 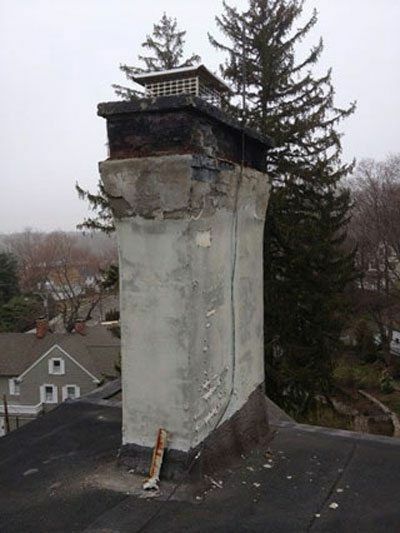 The chimney below is an example of a repair that has gone bad. This used to be a brick chimney and then someone tried to fix it by putting a cement layer over it. Putting cement to seal the brick is not a bad idea, but the very top of the chimney was not properly sealed and water leaking in causing the cement to crumble. At the bottom of tis shimney is no flashing either. They did the stucco layer but never added the necessary metal flashing to make the transition to the roof. Notice the tar that is smeared at the base of the chimney to tie the roof in. The stucco on this chimney is breaking apart. Repairing this chimney and the seal it would be the correct way to go about it. 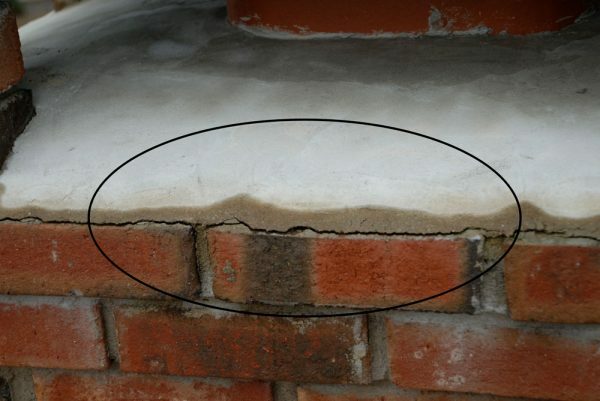 When cracks develop on a chimney, the water seeping in from the cracks will compromise the integrity of the rest of the structure. It is best practice to have the chimney inspected every 5 years to make sure all cracks are sealed.